Many of us think of ourselves as do-it-yourselfers. We look at a project, gauge the amount of cost to hire a professional, examine the viability of doing it ourselves and the amount we can save in the long run. While this might be a good idea if you want to paint your home or install landscaping, the same cannot be said about trying to do your own solar installations. Solar is a totally different ballgame and, if not done right, can actually cost you a lot more in the long run. The first thing you need to know is that solar installers are professionally trained, many receiving special certifications called NABCEP Certification. There are many nuances that you need to know for solar installation that the standard internet search is not going to provide. 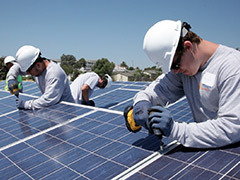 Longevity of a professional solar installation is estimated to be around twenty five years. With the lack of knowledge base, doing a solar installation yourself can reduce the longevity so that you have to replace them sooner. Maintenance can be a major topic, as many professional solar installers will offer a maintenance program, but not so when you do it yourself. Maintaining solar panels can be time consuming, and you are going to have to measure what your time is worth. One of the biggies is the fact that you can’t just install your own solar panels and leave it at that. They must be certified. This process is accomplished by the professional installer, but if you try to do it yourself it can take months and cost thousands of dollars. The solar panels will need to be inspected and approved. A professional solar installation can get these processes done, but doing it yourself may cause problems that require you to reinstall or worse yet, remove and then hire a professional. Placement of solar panels is the key to success. Misjudging the placement can cause a major investment to go completely awry and the panels to be useless. The addition of knowing the maximum sun exposure, trees that may need to be removed (even if you didn’t think it was required) and other natural areas that could affect the efficiency is simply not worth the risk. Posted on July 11th under Energy of Stars.